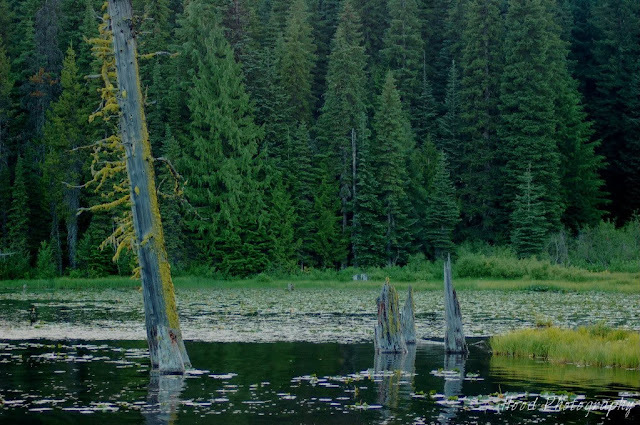 From any point around Trillium Lake, the old tree at the north side can be seen. It is very tall and noticeable, and the yellow lichen growing along its old trunk and broken branches makes it even more so. A few years ago there were two trees, but one of them has since fallen. So this one is the lone survivor. Every year I cringe when I go up for the first time in the spring, hoping it made it through the winter. That hawk is guarding the tree! Nothing will happen to it while he's standing watch. That's just a beautiful picture! What a lovely spot. I love the big bird, looks like he might have some dinner in his beak! I hope the tree stands for a long time! It really is striking! That bird must have a gorgeous wiew from up there. Looks like a beautiful place! I do appreciate it and hope to see you next week.